Within the City of Colorado Springs fences no higher than six (6) feet are allowed to be constructed anywhere on a property without obtaining a building or fence permit through the Regional Building Department (RBD), except within established preservation areas. 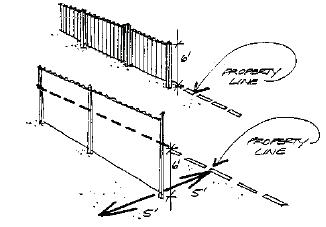 Fences may even be constructed on a property line. Consult Property Lines for more info. Fence height is measured from the top of the fence including fence poles, posts, and finials to the finished grade on both side of the fence. 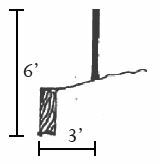 If the height of the two (2) sides varies, then the larger shall be used in determining the height of the fence. When located within three (3) feet of the face of a retaining wall, height is measured from the top of the fence to the finished grade at the bottom of the retaining wall. The finished grade of the fence area shall not be altered to artificially comply with these regulations. An additional 12 inches of height is permitted for fence posts, poles, and finials when spaced 8 feet (8) or more from each other. Accessory structures are not allowed within the front yard setback. Fences greater than six (6) feet in height are also required to be permitted by the RBD. For more information on building and fence permits, contact the RBD at (719) 327-2880. Fences are required to comply with all Sight Visibility regulations found in the Traffic Criteria Manual. Sight Visibility regulations relating to intersections can be found in Table 1, Section 4.4. For residential properties, fences and other solid items should not be placed within five (5) feet on either side of the driveway and within ten (10) feet of the back of the sidewalk. For questions regarding sight visibility, contact Traffic Engineering at (719) 385-5908. Before you dig your post-holes, it is a good idea to locate your utility lines. Call *811 for a free utility locate. If you do not have your utility lines located before you dig and you happen to hit a buried utility line, you are responsible for the damage. For questions regarding permitting, contact the Regional Building Department at (719) 327-2880. For questions regarding sight visibility requirements,contact Traffic Engineering at (719) 385-5908. For questions on locating your property lines, consult Property Lines and contact a Licensed Surveyor.